Celebrating Sankranthi, Pongal? Try sugarcane juice Pongal. Instead of jaggery or sugar, use sugarcane juice. Sugarcane juice has several health benefits just like jaggery. It is fibrous, rich in iron, calcium, potassium, magnesium, and manganese. In addition, it has amino acids, thiamin and riboflavin. It is rich in dietary fiber. It is diuretic, controls bad breath, helps in strengthen liver and reduces fatigue. 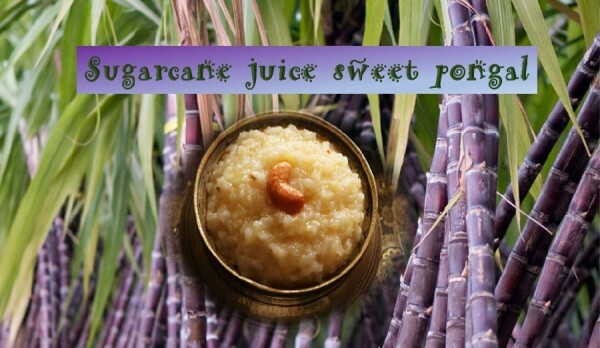 Try sugarcane juice sweet Pongal recipe. Roast the moong dal for few minute and wash with rice. Strain sugarcane juice and collect clear sugarcane juice. Transfer cooked moong daal- rice mix to a vessel and add sugarcane juice. Add cardamom powder. Mix well on low flame, till the consistency of the Pongal becomes slightly thick. If needed add little sugar or jaggery. Heat ghee in a pan, add cashew, raisins and cloves. Fry for couple of minutes. Add fried cashew, raisin and cloves to sugarcane Pongal. Mix well. Serve hot sweet Pongal for lunch or dinner.